A dinosaur's imagination never goes extinct. A little boy or girl roaming the earth in Kidorable Dinosaur Rain Boots is a little wild & a lot of fun. I'm a dinosaur. What will you be? Made from natural, waterproof rubber with orange dino tail pull tabs. Kidorable knows that kids' rain gear needs to be warm, comfortable & waterproof. We made these boots with durable rubber to keep toes dry & a comfy cotton lining to keep feet warm & comfy. A non-slip scale print sole keeps kids safe on slippery surfaces. Kidorable took rainboots and turned them into a dino dress up costume. Kids will use them rain or shine. Sure to be the cutest rain boots wherever you and your kid travel. Add in matching Kidorable umbrellas, hats, rain jacket, backpack, scarves & gloves. FUN AND PRACTICAL: If you're looking for a perfect back to school, birthday or holiday present for a kiddo, you've found it. 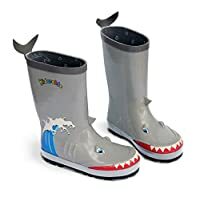 Kids love Kidorable children's' dinosaur rainboots in any weather. Our rubber boots are great for little kids, big kids & toddlers. 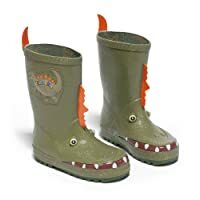 Kidorable Dino Rain Boots are made of comfortable, waterproof natural rubber, with fun dinosaur teeth, eyes and spines. Non-slip soles keep little puddle jumpers safe & an easy pull-on dino tail heel tab let's kids put on their rainboots by themselves. Our absorbent 100% cotton kids hooded towels make drying off after the pool, the beach or a bath fun. This soft and fuzzy towel is large enough for your kid to grow into, comes in a smaller size for little kids & babies and bigger for toddlers & big kids. Wrap up your kiddo and their imagination in this comfortable, soft and fluffy cotton towel after a cozy bath. Bath time is more fun with a Kidorable towel, complete with a hood to help dry that wet hair and keep your kiddo warm as they hop off to bed. The adorable hood on this cozy cotton towel keeps your little one's head warm after splashing in the pool or playing at the beach. A button at the top lets your boy or girl fasten this towel around their shoulders while they splash off to more water fun. This cozy, fuzzy-hooded, 100% cotton bath towel is a great beach towel too. Our hooded kids towel comes in two sizes, with small the right fit for your newborn baby to 2-year-old toddler, & the large for your three to seven year old little boy or girl. Bears love to stay warm and cozy in the cold months. A little boy or girl with a Kidorable bear scarf is warm and cozy wherever they travel. I am a bear. What will you be? Handmade knitted winter scarf made from lightweight, soft acrylic yarn, one size. Brighten up the cold winter weather and bring a smile to your kid's face with a Kidorable knit Brown Bear scarf. Made from machine washable, lightweight, soft acrylic this warm winter scarf keeps necks warm while kids explore the outdoors in any weather. Kidorable Brown Bear Knit Scarves have everything your little bear needs to stay warm during imaginative, outdoor play. A fun, smiling bear face adds extra fun to this brown knit scarf for kids. One size fits most toddlers, little kids and big kids. Kidorable Brown Bear Knit Scarves are handmade from soft acrylic yarn. Complete the outfit with matching knit mittens, knit hat and umbrella to keep your little bear cub warm and dry waiting for the school bus, playing outside, at the park or traveling. FUN AND PRACTICAL: If you're looking for a Back to School, Birthday or Holiday present for a kiddo, then you've found it. 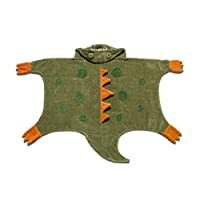 Boys & girls love Kidorable Brown Bear Knit Scarves for outdoor play in all weather, winter & fall, in the backyard or on trips. More than just a pair of boots, these playful puddle magnets make a wonderful gift. Made of natural rubber, they are guaranteed to be the cutest boots in your neighborhood. 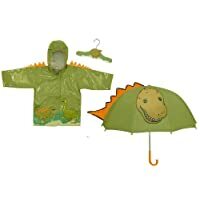 Get matching Kidorable Dinosaur umbrella, coat, boots and more! Kidorable has taken the idea of the humble umbrella and transformed it into an imagination tent. We are proud to offer the most popular assortment of whimsical umbrellas ever created. Made of 100% nylon, Kidorable umbrellas are child-sized for those little hands. A Lotus represents purity and beauty. A girl with Kidorable Lotus Hangers shines a light, inspiring those around her. I'm a Lotus Flower. What will you be?